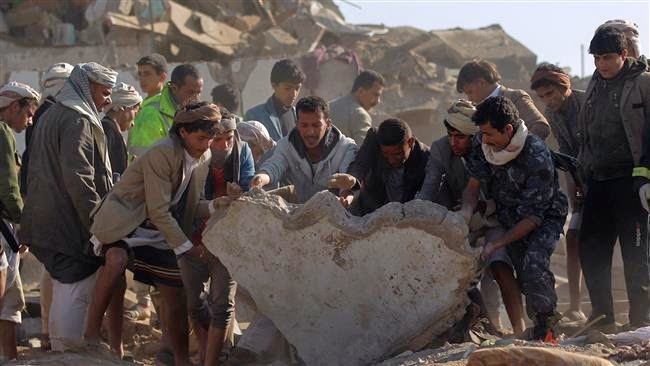 As per media reports, at least 35 people have lost their lives and dozens of others sustained injuries as Saudi Arabia pushes ahead with its airstrikes against neighboring Yemen. Doctor Ali Sarieh, director of medical emergencies at the Yemeni Health Ministry, told the official military news service, 26september, on Sunday that Saudi airborne attacks on Yemen killed 35 people and wounded 88 others overnight. He added that the Saudi military aircraft pounded areas in Sana'a province, where Ansarullah revolutionaries are in charge of the embattled seat of government, as well as the northwestern and western provinces of Sa’ada and Hudaydah. On March 26, the Al Saud regime unleashed deadly air raids against Yemen in an attempt to restore power to fugitive Yemeni president, Abd Rabbuh Mansur Hadi, a close ally of Riyadh. Hadi stepped down in January and refused to reconsider the decision despite calls by Ansarullah revolutionaries. The Yemeni parliament did not approve his resignation. Gradually, as the Yemeni government failed to provide security and properly run the affairs of the country, the Ansarullah fighters started to take control of state matters to contain corruption and terror. The fugitive president fled Aden to the Saudi capital city of Riyadh after Ansarullah revolutionaries advanced toward Aden, where he had sought to set up a rival power base, and withdrew his resignation. The Houthis, however, say Hadi lost his legitimacy as president of the country after he escaped the capital in February. Hadi left the 26th Arab League summit in Egypt for Saudi Arabia on Saturday, and his Foreign Minister Riyadh Yassin said he will not return to Aden "for now." The many media reports justify the war while it is evident that war is not solution of anything. The innocents will suffer a lot and it has started. As capital punishment is prohibited so the war should also be prohibited for saving many lives.